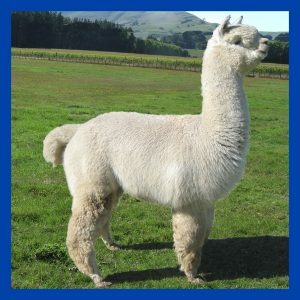 Bred by Australias famous Forestglen Stud, Tarquin was exported to New Zealand as a young male, where he stood at Waimarie Alpacas in the Hawkes Bay for several years. After having bred a couple of our alpacas to Tarquin and being very satisfied with the results, we were delighted to have the opportunity to add Tarquin to our stud stable following the dispersal of the Waimarie herd. Tarquin totally meets our philosophy of Pedigree Matters : Tarquin’s sire, the iconic Purrumbete Inti, had an incredible impact on the alpacas of Australasia, with the dramatic improvement in fleece and frame being attributable to Inti and a handful of other studs imported from Peru in the 1990’s. Now deceased for several years, the number of Inti offspring are dwindling, with Tarquin one of the last of his sons available at public stud – what an opportunity to add the most famous genetics to your herd! Forestglen stud in Australia was ahead of the pack in including Australia’s most iconic impact sires in their herd. So Tarquin’s dam, the exceptional female, Forestglen Alannah, a light fawn, includes in her genetic lineup such impressive studs as Purrumbet El Dorado, Forestglen Maestro (both sires of multiple champions) and the excellent female, Purrumbete Minty. As well as having these sought after and increasingly rare genetics, Tarquin ET is an upright, solid framed male with excellent conformation. Tarquin has all the positive traits you could desire to see in your herd – fine fibre, great lustre, soft handle and density, this is your chance to improve your own breeding programme.